Do you charge for travel time to go and get the parts? No. We only charge for time actually working on the vehicle. Before Lube Mobile commences any work, the mechanic will show you an itemised quote of work required and associated costs - you are always in control of the cost and will not get a nasty surprise. Yes. Payment needs to be made at the completion of the job. We accept EFTPOS, all major Credit Cards incl American Express and Diners, Cash, Cheque, Fleetcard, MotorPass and MotorCharge. All our services and repairs are fully guaranteed work - not just a patch up to get you going - Please click through to WARRANTY and get all the facts. Can Lube Mobile do all Car Repairs? Do you do repairs as well as services? Of course, we have fully equipped mobile workshops and only employ fully qualified and highly trained technicians. Click here Car Repairs to find out more. Over 95% of all our work is performed on site at your convenience. Yes we only employ fully qualified technicians that have been in the trade for 4 years or more. Lube Mobile also continues their training with internal and external training courses. We do train some apprentices to help the trade but it's the mechanics in control of working on your car. No, we are a service and repair company just like any workshop, except we come to you. There are no ongoing membership fees because Lube Mobile isn't a club - you only pay as you need us. We can usually organise same or next business day bookings. You can email or call 13 30 32 to arrange an arrival time. The earlier you call or email the better. Our first appointment has an arrival time of 8.00am through to our last arrival time between 2.00 and 4.00 pm (dependant on workload). Our helpful Australian Contact Centre are available after 7.00am through to 7.00pm (AEST) on 13 30 32. Yes. 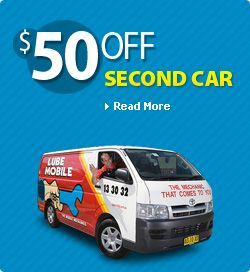 Lube Mobile technicians come to you for car service or repair 6 days a week - Monday to Saturday. Due to the extra costs of Saturday overtime, there is a $29 surcharge for any job booked in for a Saturday. Yes and No. We are closed on Christmas and Boxing Day, New Years Day, Good Friday, Saturday and Easter Sunday and Anzac Day. However on other national or local public holidays we are open with a limited crew. Please call 133032 to confirm our hours of operation if your need repair or service on your car. There is a $29 surcharge for any job booked in on a public holiday. How does your pricing work ? This depends upon what you need. We always strive to give you a fixed price up front and let you be in control of costs. If you are unsure what is wrong, and need a mechanic to just come out and fix the car, we have a Repair Call Out of $ 134.80 which includes 15 minutes of labour. After this, we then charge a reasonable hourly rate in 15 Minute increments.